Chris Summit on Mother Nature. The rock of the Bay Area is as diverse as the landscape and people who live here. Sandstone, schist, rhyolite, basalt, and chert are the most prevalent types of stone found locally and they each offer a unique experience. A few crags with sport and trad climbing can be found around the Bay, but the abundance of rock is just the right size for bouldering. All along the breathtaking Pacific Coast, from the Mendocino County line south past the Golden Gate to Big Sur, is a rich variety of stone to choose from in an incredibly scenic environment. Inland hills, mountains, rivers, and lakes also have great bouldering in lush forests and on golden, grassy hillsides. Most boulders are close by cities and highways and on the many fine beaches and offer an almost endless supply of easily accessible problems. 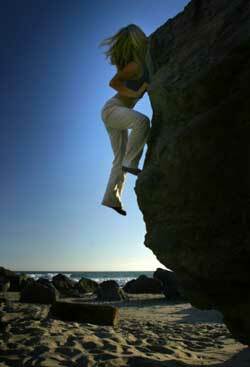 As I am sure you will find in this guide, great bouldering is never too far away from wherever you are around the Bay. Oakland - Great Western Power Co.
For crash pad rentals, vEighteen covers the whole Bay Area and they deliver! Lisa Quigg at Stinson Beach. Just a couple miles north of the Fort Ross bouldering area and about 16 miles north of Jenner on CA-1 is Stillwater Cove Campground, call (707) 847-3245. A few miles north of Fort Ross and Stillwater Cove and about 20 miles north of Jenner on CA-1 is the amazing Salt Point State Park and the radical Salt Point bouldering areas. Camping is available at Gerstle Cove Campground and Woodside Campground, call (707) 847-3221.
or 1 800 444 PARK. Pomo Canyon Campground is off CA-1 just south of Jenner and CA-116 and just north of Goat Rock State Park in Bridgehaven. Take Willow Creek Rd. east from CA-1 for about 2.5 miles to the right turn onto the dirt road that leads to the campground. CLOSED IN WINTER. Austin Creek State Recreation Area in Guerneville is adjacent to the awe-inspiring Armstrong Redwoods State Reserve. The majestic grove of giant primeval redwood trees is a glimpse of how the whole area used to look before logging. Camping is available at Bullfrog Pond for $25 per night. Call (707) 869-9177 ext 3# (Monday-Friday) (707) 869-2015 (weekends). Between Jenner and Guerneville on Moscow Rd. off of River Rd. (CA-116) in Duncan’s Mills is the popular riverside campground, Casini Ranch, call (800) 451-8400. The nearest climbing gear retailers for the North Coast are Sonoma Outfitters and REI in Santa Rosa, an hour drive inland (east). A gas station/mini mart/deli is the main stop in Jenner. The excellent River’s End restaurant offers fine food, wine, and sunsets. 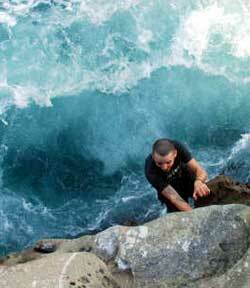 Less than ten miles south of the Jenner climbing areas is the quiet fishing village of Bodega Bay. Get gas at the Texaco on CA-1 and food, beer, and supplies at Diekman’s Store, also on CA-1. Enjoy the catch of the day with great views of the bay at The Tides Wharf and Restaurant (seen in Alfred Hitchcock’s classic The Birds). Gas food and lodging can all be found in Guerneville about 12 miles east of Jenner. From Jenner (CA-1) take River Rd. (CA-116) east for about 12 miles to Guerneville. There you can find gas, a 24hr Safeway, a mui delicioso taco wagon (usually in the Safeway parking lot) and the scrumptious Andorno’s Pizza (16205 1st St.). Kevin Jorgeson on Full Fever. Marin has camping available at Mount Tamalpais State Park (near the Mount Tamalpais bouldering areas), Samuel P. Taylor State Park (15 minutes west of US-101 on Sir Francis Drake Blvd.) and Point Reyes National Seashore, which only offers backcountry hike-in or boat-in camping. For reservations at Mount Tamalpais or Samuel P. Taylor contact Reserve America or for information about camping at Point Reyes call (415) 464-5100. Lake Berryessa has seven private resorts that have camping. Most of the resorts are on the west and south shores off CA-128 or Knoxville Rd. 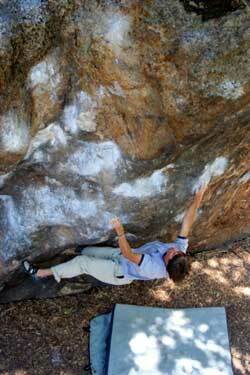 only a few miles from the Vacaville and Putah Creek bouldering areas. Napa has a good campground: Skyline Wilderness Park on 2201 Imola Ave., which is about 15 miles west of Lake Berryessa and the Putah Creek bouldering area. Call (707) 252-0481. High Tech Burrito at 484 Las Gallinas, San Rafael. Just off US-101 in Corte Madera (south of San Rafael) is an REI with almost everything you’ll need for climbing or camping. Take the same Paradise Dr./Tamalpais Dr. exit as for the Ring Mountain bouldering area, but go to the shopping center on the west side of US-101 off Tamalpais Dr. A couple miles west of 101 on Tamalpais Dr. is downtown Larkspur and the historic Lark Creek Inn at 234 Magnolia Ave. Partake in the happy hour (M-F half off beer and cocktails) and enjoy delicious, seasonal, farm fresh cuisine. The oceanside town of Stinson Beach (near Stinson and Mickey’s Beach bouldering areas) has a good market: Beckers by the Beach has good food, drink, and supplies. Our favorite Stinson restaurants: Sand Dollar & Parkside Cafe. An assortment of gas stations, stores and restaurants can be found off CA-12 and CA-29 in downtown Napa or Sonoma. In Napa try the muy bueno High Tech Burrito 641 Trancas St. (off CA-29). In Sonoma enjoy a Bay Area original, the delicious Mary’s Pizza Shack in the Sonoma Plaza and on Sonoma Hwy. (CA-12). Santa Rosa is one hour north of San Francisco on US-101 and has all the amenities you might need: gas, climbing/camping gear (Sonoma Outfitters, REI and Vertex) and indoor climbing at Vertex. A wide variety of dining is available in Santa Rosa. Try the Russian River Brewing Company on Fourth St. in downtown or the tasty Taqueria Santa Rosa. Southeast of Oakland and Berkeley camping is available at Lake Chabot in Anthony Chabot Regional Park. From I-580 east in Castro Valley take the Redwood Rd. exit and turn left onto Redwood Rd. or from I-580 west take the Castro Valley exit and turn left onto Castro Valley Blvd., then right onto Redwood Rd and follow it to the park. Call in advance (888) 327-2757 option 3, extention 4502. Camping is available in the hills between Oakland and San Jose at Sunol Regional Wilderness near Pleasanton. Take I-580 east to I-680 south to Calaveras Rd/CA-84, turn left onto Calaveras, then take Geary Rd. to the park. Enjoy a short hike and some fine basalt cragging at Indian Joe Caves on Indian Joe Creek Trail inside the park. Try the eclectic mix of food vendors at the Emeryville Public Market (5959 Shellmound St.). It’s off I-80/I-580/I-880 in Emeryville south of Berkeley and north of Oakland. Take the Powell St. exit east to Shellmound St.
Gas, food, climbing/camping gear (REI and Marmot), and the largest indoor climbing gym in the Bay Area: Berkeley Ironworks. Enjoy an eccentric assortment of food and shops on the busy Telegraph Ave. in downtown Bezerkly (take Ashby Ave. a few miles east of I-80). 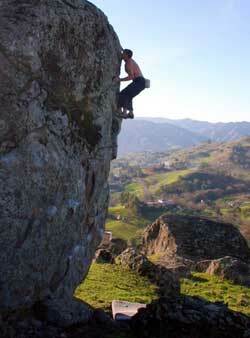 Gas, food and shopping malls right off I-80 only a few miles from the Vacaville Open Space bouldering areas. There is not much camping in San Francisco so your best bet is to look for a San Francisco hotel deal. Camping is available at Castle Rock State Park about a three mile hike from the parking lot. The primitive sites are about $10 per night and are first come, first serve. Near the city of Saratoga on Big Basin Way is a nice campground called Saratoga Springs with RV and tent camping. San Francisco’s Chinatown is one of the largest outside of Asia and offers fine food all day and all night. Mission Cliffs has indoor climbing and gear in a good atmosphere. For gear go to The North Face at 180 Post St. Get gas and food on either CA-1 or US-101. For great beer and food at reasonable prices enjoy Gordon Biersch Brewing Company on 33 E. San Fernando St. (downtown San Jose). A gas station/mini mart/deli and popular motorcycle hangout is at the intersection of CA-35 (Skyline Blvd.) and CA-84 in Sky Londa a few miles north of the Aquarian Valley and Skyline bouldering areas and across the street from the infamous Alice’s Restaurant (where you can get what you want). Pacific Edge is a great indoor climbing gym and gear retailer in Santa Cruz (104 Bronson St.). If you feel like having more fun in the sun then don’t miss the oldest amusement park in California: the Santa Cruz Beach Boardwalk. Gas, food, supplies, climbing gear and indoor climbing (Sanctuary Rock Gym in Sand City) are all located just a few miles apart near CA-1. Don’t miss the restaurants on the famous Canery Row. Bay Area Rock by Jim Thornburg is a great guide by the longtime local photographer, climber, writer, first ascentionist and all around good guy. Rock Climbing the San Francisco Bay Area by Tresa Black is the most thorough guide for the Bay Area with information on all types of climbing at all the best areas. Top rope, sport, traditional and bouldering are all covered. Rock Climbing Guide to the Castle Rock Area by Bruce Morris is the first edition of the complete guide to top rope, sport and traditional climbing and bouldering in and around Castle Rock State Park. Wine Country Rocks by Chris Summit covers top rope, sport and traditional climbing as well as almost all of the legit bouldering found in and near the North Bay's "Wine Country".